The US and Turkey have agreed to work together to drive Islamic State (IS) militants from northern Syria, senior US officials said Monday, as Turkish Prime Minister Ahmet Davutoglu vowed to press ahead with parallel strikes against Kurdish militants. The potentially game-changing accord with the US comes with ambassadors from all 28 NATO countries due to meet on Tuesday in Brussels — at Turkey’s request — to discuss Ankara’s campaign against IS and Kurdish militants. Turkey, meanwhile, fuelled the growing anger of its Kurdish minority by shelling a Kurdish-held village in northern Syria while its warplanes continued to pound Kurdish targets in northern Iraq. Referring to the Islamic State group by the acronym ISIL, a senior US official told AFP that Ankara and Washington aimed “to establish an ISIL-free zone and ensure greater security and stability along Turkey’s border with Syria”. Details of the zone “remain to be worked out”, the official, who asked not to be named, said during a visit by President Barack Obama to Ethiopia, while adding that “any joint military efforts will not include the imposition of a no-fly zone” — a long-standing Turkish demand. It would, however, entail Turkey, Nato’S only mainly Muslim member, supporting US “partners on the ground” already fighting IS militants. But many question whether Turkey is more interested in limiting Kurdish capabilities in Syria and Iraq than tackling IS. Davutoglu said on Monday that Turkey would press ahead with military operations against the outlawed Kurdistan Workers’ Party (PKK) until the group disarmed. The PKK has fought a decades-long insurgency in southeastern Turkey but maintains rear bases in northern Iraq and Ankara regards the main Syrian Kurdish group fighting IS — the Democratic Union Party (PYD) — as the PKK’s Syrian branch. Turkey has lumped its campaigns against the PKK and IS together into a broad “war on terror,” even though the secular PKK and Islamist IS are themselves bitterly opposed. “We will continue our fight until we obtain a certain result,” Davutoglu told ATV television, urging the Kurdish separatists to deliver on a 2013 promise to lay down arms. Turkey has called an extraordinary Nato meeting over its “anti-terror” offensive against the Kurdish rebels and IS, and the military alliance’s 28 members are due to attend the talks in Brussels on Tuesday. US State Department spokesperson John Kirby said that Turkey had a “right to defend itself” against the PKK, which the US also labels a terrorist organisation, while Nato chief Jens Stoltenberg also backed Ankara. The Nato official, however, told the BBC on Sunday that “self-defence has to be proportionate”, while French President Francois Hollande said on Monday that Turkey must “be careful not to confuse the target”. Stoltenberg also cautioned Ankara about burning bridges with the Kurds. “For years there has been progress to try to find a peaceful political solution,” he told Norwegian state broadcaster NRK. The Syrian Kurdish People’s Protection Units (YPG) — which routed IS from the flashpoint Syrian town of Kobane with the help of Western air strikes this year — said Turkish tanks hit its positions and those of allied Arab rebels overnight in Zur Maghar village in Aleppo province, wounding four rebels and several villagers. 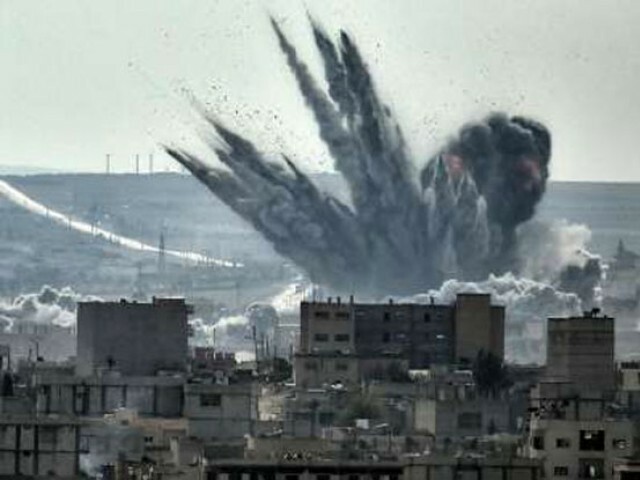 But Turkish officials denied the military was deliberately targeting Syrian Kurds and said it was responding to fire from the Syrian side of the border. Davutoglu told a group of Turkish newspaper editors that Ankara’s intervention in Iraq and Syria would “change the balance” in the region, but ruled out sending ground troops into Syria. Turkey has also given the United States the green light to use its Incirlik air base to attack IS after months of tough negotiations. Davutoglu said Ankara’s demands for a no-fly zone were addressed “to a certain extent”, according to the Hurriyet daily. “Air cover is important, the air protection for the Free Syrian Army and other moderate elements fighting Daesh,” he said, using the Arabic acronym for IS. Davutoglu ordered the air strikes and artillery barrages after a devastating suicide bombing last week in a Turkish town close to the Syrian border that killed 32 people. Ankara blamed the attack on IS. The bombing in the predominantly Kurdish town of Suruc incensed Turkey’s Kurds, who have long accused the government of colluding with IS, allegations the authorities categorically deny. More than 1,000 people with alleged links to IS, the PKK or other far-left groups had been rounded up nationwide. The PKK said a truce between the government and the militants that has largely held since 2013, while peace talks were ongoing, had been rendered meaningless by the attacks. Gunmen shot dead a paramilitary police commander late on Monday in a predominantly Kurdish part of eastern Turkey. No one claimed responsibility for the assault in the province of Mus but suspicions fell on the PKK. On Sunday, the PKK’s military wing claimed the killing of two Turkish soldiers in a car bombing in Diyarbakir province. And last week, two Turkish policemen were shot dead in their beds in the southeast, killings claimed by the PKK.